Does "self-defense" justify Israeli attack on Gaza? erful Israel lobby scorns as "self-hating Jews" the many Jewish Americans who oppose Israel's violence against Palestinians. It calls non-Jewish critics "anti-Semites," a label that associates them with the racism that fueled the holocaust. And it has turned U.S. policy toward Israel into a moral blank check. President Obama and the American political and news establishments all agree with the Israeli government: the ongoing slaughter of civilians in Gaza should be seen as regrettable but unavoidable collateral damage. Who, they ask, can deny that Israel has the right to defend its own people by attacking the source of a continuing barrage of rockets launched by Hamas "terrorists" from inside the densely populated Gaza strip? Palestinians answer that Israel is the aggressor, and their rocket barrage is a desperate act of self-defense against the deadly stranglehold of Israel's blockade of Gaza. As Palestinian human rights worker Mohammed Suliman explains: "The besieged Jews of the Warsaw ghetto had a motto 'to live and die in dignity.' As I sit in my own besieged ghetto, I think how Palestinians have honored this universal value. We live in dignity and we die in dignity, refusing to accept subjugation" (Huffington Post 7/29/14). A blockade is an act of war. Israel has been at war with Gaza for 7 years. A bit of history can help us appreciate what's at stake here. In 2006 Fatah (headed by Mahmoud Abbas) lost to Hamas in a national election for seats in the Palestinian Legislative Council. Abbas continued as president of the Palestinian Authority and Hamas joined with Fatah in a unity government. Fatah lost the election because it had become corrupt during its years in power. It was also discredited for failing to achieve an independent state despite decades of negotiations with Israel (during which Israel continually expanded Jewish settlements in the West Bank). The election outcome was a shock to the U.S. and Israel. They greatly favored Fatah because it had recognized Israel's existence and renounced violence. They continue to label Hamas a terrorist organization because it has until now refused to recognize Israel or renounce violence. In 2007 the unity government collapsed. Palestine split politically: Hamas ousted Fatah from Gaza, leaving parts of the West Bank (those not taken by Israeli "settlers") under the control of Abbas and Fatah. Egypt (under the military dictatorship of Mubarak) and Israel immediately imposed an air, sea and land blockade on Gaza which continues to this day. (Hamas is an offshoot of the Muslim Brotherhood, an adversary of Egypt's military.) 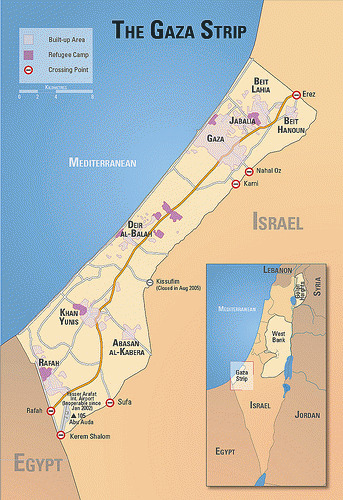 Gaza became what British PM David Cameron in 2010 called "the world's largest open-air prison." A fortified wire fence straddles the entire border between Israel and Gaza, densely loaded with electronic sensors, video and night vision cameras, and watchtowers mounted with remote-control machine guns. Award-winning Palestinian journalist Mohammed Omer describes what life inside is like: "We cannot leave or enter without Israel's permission. Israel tells us what we are allowed to eat, raids at will and often, decides which products we're allowed to have, down to toilet paper, sugar and cinderblock. It arrests our children, fathers and mothers, and can hold them as long as it wants. Its snipers amuse themselves at the expense of our children." Hamas's military prospects are hopeless. The website Global Firepower ranks Israeli military power 11th in the world (even without its estimated 80 nuclear warheads). Israel has an army, navy and air force comprising 176,500 active military personnel and about 465,000 trained reservists. Hamas has only a paramilitary ground force of about 20,000 lightly armed soldiers and police. Hamas's rockets are unguided. Of the 100-200 launched each day, a third don't even reach Israel, and many rockets with the most threatening trajectories are destroyed by Israel's Iron Dome missile defense system. As of August 2, only three Israelis have been killed by these rockets, and 63 Israeli soldiers have died in the attack on Gaza. Israel's combined air, naval and ground assault has killed over 1600 Palestinians, three quarters of them civilians (incl. many children). So why doesn't Hamas stop its doomed battle and join President Abbas in negotiations with Israel for the creation of an independent Palestinian state that would include the West Bank? Just this spring, President Obama wrote to President Abbas that "the United States remains deeply committed to a negotiated outcome between Palestinians and Israelis that result in an independent, viable, and a contiguous Palestinian state ." Israel has colonized the West Bank with 500,000 Jewish "settlers." Does anyone think this can be undone? Should the U.S. be supporting Israel's bid to create a single apartheid state over all of Palestine?